Casino stocks now provide some great dividends for investors. For decades, casino companies have used debt and cash flow from their businesses to expand their empires around the world. Las Vegas, Atlantic City, and Macau have seen billions in new resorts built, and as companies expanded their own operations, many bought out competitors as well. However, the last few years have changed everything in gaming. Atlantic City is in decline, Macau's market is limited by the government, and Las Vegas is fully saturated with casinos. So, companies have excess cash to pay in the form of dividends, which Las Vegas Sands Corp. (NYSE:LVS), Wynn Resorts, Limited (NASDAQ:WYNN), and Melco Crown Entertainment Ltd (NASDAQ:MLCO) are now doing. The biggest company in gaming is Las Vegas Sands, and it's no coincidence that it's also the biggest dividend-payer in the bunch. The company was an early builder in Macau and one of just two casino operators in Singapore, leading to a strong source of cash flow for the company. Las Vegas Sands' stock yields 5.2% today, and as you can see below, the company is generating more in EBITDA (a proxy for cash flow) than it pays in a dividend. LVS Net Income (TTM) data by YCharts. There's also further upside for Las Vegas Sands' dividend. There are few opportunities to build new mega resorts around the world, so as the company generates excess cash it will either be able to pay down debt or increase its dividend. And its biggest market, Macau, is now growing again, so cash generation should increase. If you're looking for a dividend in gaming, this is the best place to start. Wynn Resorts was once a big dividend payer, shelling out $8 per share to investors on top of periodic special dividends. But a decline in Macau's gaming market and cash needs to build Wynn Palace in Macau and Wynn Boston Harbor caused Steve Wynn to cut the dividend to $2 annually, and we haven't seen a special dividend since. But the stock still yields 2.2%, and there's potentially upside in the dividend. Wynn Palace is now open, and is beginning to generate cash for the company. As revenue grows and Macau recovers we should see over $500 million in EBITDA from this resort alone, which could then be used to pay down debt or increase the dividend. This isn't the highest yielding gaming stock, but if Macau grows and Wynn's new resorts pay off as hoped, it could easily return to a dividend of $8 per share or more annually, a big payoff for patient investors. Melco Crown is another gaming company that pays a dividend, but it takes a slightly different approach than Las Vegas Sands and Wynn Resorts. It adjusts the dividend each quarter depending on how much net income it has. If income declines, so does the dividend. 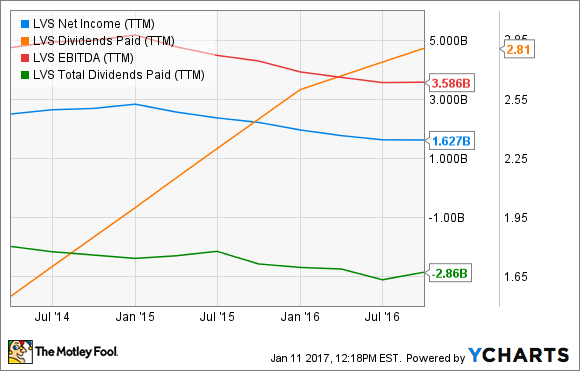 In 2016, that resulted in the dividend declining from $0.0219 per ADS in Q1 to $0.189 per ADS in Q2 and then jumping to $0.0378 per ADS in Q3 as operations began to recover. That makes it difficult to lock down a dividend yield, but an estimate of less than a 1% yield is a safe assumption for investors. While dividend uncertainty may not be a good thing for some investors, the policy is good for Melco Crown's business. Cash is preserved when operations weaken, and investors still get dividend growth when net income improves. This won't likely be the biggest dividend payer in gaming anytime soon, but it's a dividend stock with nearly 100% exposure to Macau's gaming market. So if you're bullish on Macau's gaming market this is a good way to bet on dividend growth.